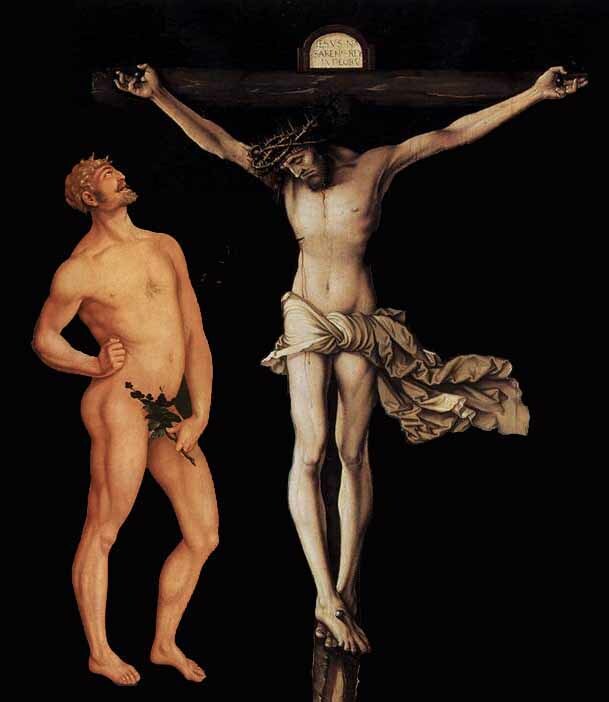 "Adam and Christ," a composite by the author of two paintings by Hans Bauldung Grien (Austrian painter, 1484/85-1545), "Adam" (1520-23, left), Museum of Fine Arts, Budapest (Szepmuveseti Muzeum); and "Crucifixion" (1512, right), Linden panel, 152 x 104 cm, Staatliche Museen, Berlin. Larger image of Adam and Christ composite. 12 "Therefore, just as sin entered the world through one man, and death through sin, and in this way death came to all men, because all sinned -- 13 for before the law was given, sin was in the world. But sin is not taken into account when there is no law. 14 Nevertheless, death reigned from the time of Adam to the time of Moses, even over those who did not sin by breaking a command, as did Adam, who was a pattern of the one to come. Big Concept 2. We are united with Christ so solidly that we are "in him," we are "part of the Body of Christ" and he is our Head. This is true to such a degree spiritually, that when Christ died on Golgotha, it is as if we died with him. This affects how we see ourselves -- and our sin. Have you ever wondered how it is fair and just that Jesus died for your sins instead of you? This chapter gives an answer. Have you ever wondered what it really meant to be "in Christ"? Here's perhaps the best explanation in all of Scripture of the nature of our union with Christ. But let me warn you, these are difficult concepts for us to understand, especially for those of us immersed in a Western world view. Paul's discourse on the relationship of Adam to Christ may seem irrelevant to you, but hang in there. You'll find that it will begin to make sense, especially when we come to understanding baptism (6:2-4). The Bible calls the first human "Adam" and tells his story in Genesis 2 and 3. In Hebrew, the word 'ādām is the generic word for "human, humankind" (as opposed to '�sh which refers specifically to man as male gender).50 Paul draws on the implications of Adam's actions to all of his descendents. You know the story. 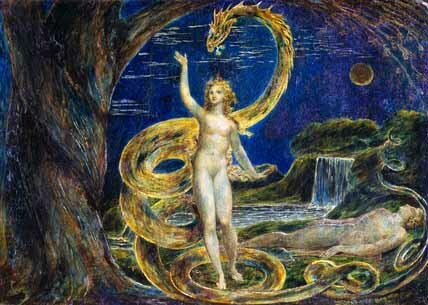 William Blake (1757-1827), detail from "Eve Tempted by the Serpent," tempera. England, late 18th century. Larger image. Man is created "good" (Genesis 1:31) and he enjoys a precious fellowship with God (Genesis 3:8-9). Adam is innocent but he is not like a robot. He possesses the freedom, as we do, to choose right and wrong, though up until the time of his sin, he has believed what God tells him and has chosen to act in accordance with this belief. 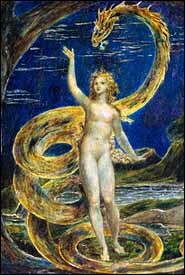 Satan, disguised as a serpent, deceives Adam and Eve into thinking that by disobeying God he can become like God himself (Genesis 3:4-5). Adam and Eve believe Satan's deception more than they believe God's Word, and give in to this temptation. It is an ancient story, but one that has played itself out in our own lives many times. Because of Adam's unbelief and resulting sin, the Word of God comes to pass in Adam: "When you eat of it you will surely die" (Genesis 2:17). Death doesn't come immediately, but something changes. As a result of Adam's fall and God's curse on the earth (Genesis 3:17), the entire creation enters into a cycle of life, death, and decay. One day, after many years, Adam dies. And because we are his descendents, we are subject to death as well. This can be understood in two ways. Just be aware that the easiest explanation may not be the one that Paul is teaching here. I know that the first explanation is more digestible to most of us. But if that is what Paul means, why does he use the Aorist tense ("sinned," single point in past time) instead of the Imperfect tense ("have sinned and still sin," past time with a continuous sense), which would suit that meaning better? I believe Paul is introducing a Semitic concept mostly foreign to Western thinking, that one person acts for the group and that one person's actions profoundly affect the fortunes of the entire group. Let me try to explain the difficult concept that underlies this passage. Very frequently the entire nation is referred to by the name of the patriarch or as the "house" of the ancestor. Achan's sin of greed and disobedience affects the whole nation (Joshua 7). David's action in taking a census brings judgment upon Israel (2 Samuel 24). But more than just affecting a group, we sometimes see a person acting for an entire group. David's action to avert severe judgment is made for the entire kingdom. We see this in our own day. A king declares war, thus committing all the young men in his country and those of allied nations to risk their lives as soldiers. A president breaks the terms of a treaty, thereby plunging his nation into war. The ancient story of David and Goliath (1 Samuel 17) recounts an individual contest in which the destiny of entire armies and nations is vested by proxy in the winner -- a battle between champions that determines the outcome. Q1. What kinds of circumstances in modern life can you think of where a single person acts for an entire group? In what ways are members of the group tied to this person? With this background we can begin to see the role of the First Adam and the Second Adam described in this passage. (The phrase "Second Adam" or "Last Adam" comes from a related passage in 1 Corinthians 15:45.) We don't really have a single appropriate word to describe this phenomenon. Representative may come close,52 defined in English as: "one that represents another as agent, deputy, substitute, or delegate usually being invested with the authority of the principal. "53 In our culture we see such concepts in "power of attorney" and "proxy," as well as an ambassador who speaks and acts for an entire government. Solidarity carries this a step further as, "unity (as of a group or class) that produces or is based on community of interests, objectives, and standards. "54 Though we often use "solidarity" in a political sense, in our passage the idea is used in a physical and spiritual sense.55 F.F. Bruce notes that, "It is not simply because Adam is the ancestor of mankind that all are said to have sinned in his sin (otherwise it might be argued that because Abraham believed God all his descendents were automatically involved in his belief); it is because Adam is mankind. "56 We are in solidarity with Adam. We are in solidarity with Christ. Americans especially struggle with these concepts because our history is so rich in a belief in independence and a celebration of Yankee individualism. Our mythical ideal is "every man for himself" against the elements, and we delight in a person improving his economic condition by his own hard work and ingenuity. How different, for example, from an Asian view of the subservience of the individual to the needs of the group, especially one's family and the honor of one's ancestors. We chafe under ideas of solidarity and headship because of our own cultural values. But just because we struggle to grasp the concept doesn't mean that it is invalid. We must stretch to understand -- but that's okay. Now let's get back to the text. Paul is writing for Jewish Christians who revered the law, so he pauses to mention the role of law with sin. We'll consider this in more detail in Romans 7. In other words, the law was given to Moses to make man's sin more visible and stand out in stark relief from righteousness. Q2. (Romans 5:13, 20) What is Paul saying in these verses? Can there be sin without law? In what sense does the "trespass increase" (5:20) when the law is present? Verse 19 reads: "Through the disobedience of the one man the many were made sinners... " (5:19a). Perhaps a more helpful terminology might be "inherited sin" and "inherited corruption. "67 Adam's fall resulted in the corruption of the nature of all of us. Instead of being "good," we are now broken, flawed at the deepest levels. There is a mixture of both good and bad. You may think that this is not fair, but it represents reality as we know it. We have enough of our own sins to damn us without Adam's, so who are we to complain about the unfairness of Adam's sin? Now Paul begins to compare and contrast the heads of two races, the First Adam, or physical ancestor, and the Second Adam, Christ our risen Lord, spelled out in greater detail in 1 Corinthians 15:44-49. The idea of two Adams was circulating among Jews in the first century AD -- the fall of the earthly Adam (the "first Adam") and a preexistent heavenly Adam.68 Paul drew on this concept to make his point. Look at the comparisons he makes. "15 But the gift is not like the trespass. For if the many died by the trespass of the one man, how much more did God's grace and the gift that came by the grace of the one man, Jesus Christ, overflow to the many! The judgment followed one sin and brought condemnation, but the gift followed many trespasses and brought justification. Q3. (Romans 5:15-19) By what right does Adam represent all humankind? By what right does Christ become head of all who become his disciples? If Christ is not our "representative" or "head," how can his death for sins be effective for us? 48 As was the earthly man, so are those who are of the earth; and as is the man from heaven, so also are those who are of heaven. In 1 Corinthians 15 45-49 Paul is talking about this same contrast between the First Adam and the Second Adam as he does in Romans 5. Paul has laid a strong conceptual base in Romans 5 for our redemption and blessings in Christ. Now he is ready to apply these truths to human lives. Paul has been talking about abundant sin and more abundant grace. But now he pauses. Does that mean that we can sin without regard to the result? Paul's enemies probably would misunderstand what he was saying and try to cast him as soft on sin. There were some in the church known as antinomians (from anti-, "against" + nomos, "law"), who felt under no obligation to obey any moral or ethical law. Carried to an extreme, some might see Paul's teaching as an excuse to keep on sinning. Paul makes it clear that this isn't what he has in mind at all. His point is that to "continue69 in sin" (KJV, NRSV) would be to persist in our old lifestyle of sinning70 when the era of the "old" person is over. In 6:2-5, Paul ties our union with Christ to baptism. In this lesson we'll talk about union with Christ, since it is vital that we understand this point. In the next lesson we'll explore baptism and its implications more fully. "We died to sin," Paul insists. "How can we live in it any longer?" He contrasts the past with the present. "Died"71 is in the Greek Aorist tense, which refers to a past event that took place at a particular point in time, not a repeating event that continued in the past. Paul is saying that we died at a particular historical point. It is done. Finished. A fact. So what does Paul mean when he says, "We died to sin"? The short answer is that we, through baptism, have been united with Christ's death. Just as "all sinned" in Adam (5:12), so "we died to sin" in Christ (6:2). Once you understand this concept of union with Christ, you begin to see it throughout Paul's letters. Consider the how Paul's concepts relate to being united with Christ, the Second Adam. "members of the body of Christ"
"baptized into the body of Christ"
"buried with Christ in baptism"
"died" or "crucified with Christ"
These concepts all draw upon the same truth -- that we have been united with Christ. Our union with Christ is obviously spiritual rather than physical. But that doesn't make it unreal. Paul speaks of our union with Christ's death as a spiritual reality, not just a figure, analogy, metaphor, or symbol for something else. Christ as Head died for the sins of all. Now those who are "in Christ," whose lives are "hid with Christ in God" (Colossians 3:3) are redeemed. We stand before God "in Christ" as part of his body, his bride, redeemed at great cost and made holy. We are "complete in him" (Colossians 2:10, KJV, NASB). Another implication of our being "in Christ" is the necessity of love as the primary virtue of Christians. Since we are together "in Christ," rivalry is silly. We are one! "By this all men will know that you are my disciples, if you love one another" (John 13:35). In a very real sense when Christ died on the cross two millennia ago I died there, too -- and so did you. His death is my death, since I am united to him. Christ died; I died. Q4. (Romans 6:2-5) According to this passage, at what point do we move from being under the headship of Adam to the headship of Christ? Is there anything we must do to bring about this change in headship? What are the implications of us having died with Christ? We do know this for sure: We have been united with Christ at a very deep level. We are "in Christ." This has brought about a radical change in us and in our relationship to our old life and to sin. We are now "joined at the hip" to Christ -- and to one another. The implications of this union are staggering. Lord Jesus, I have been joined to you to the degree that I am one with you. I don't understand this fully, but I ask you to work in me the full power and consequence of that union. Let it utterly transform the way I live, think, and act. In Jesus' name, I pray. Amen. We are united with Christ so solidly that we are "in him," we are "part of the Body of Christ" and he is our Head. This is true to such a degree spiritually, that when Christ died on Golgotha, it is as if we died with him. This affects how we see ourselves -- and our sin. 49. Dierchomai, "to pass through, go through" (BDAG 244, 1bβ). 50. Leonard J. Coppes, 'dm, TWOT #25. 51. Alford has it both ways: "Sin ...is here, throughout, both original and actual: in the seed, as planted in the nature by the sin of our forefather; and in the fruit, as developed by each conscious responsible individual in his own practice" (Henry Alford, The Greek Testament (Chicago: Moody Press, 1958; based on 7th ed., 1852) 2:360-361). 52. So A.J.M. Wedderburn, "The Body of Christ and Related Concepts in 1 Corinthians," Scottish Journal of Theology 2 (1971), pp. 74-96, especially pp. 95-96. 53. Merriam-Webster Collegiate Dictionary (11th Edition), p. 1057. 54. Merriam-Webster Collegiate Dictionary (11th Edition), p. 1187. 55. Wedderburn, "Body of Christ," p. 95. 56. Bruce, Romans, pp. 129-130. 57. Ephesians 1:22-23; 4:15-16; 5:23. 58. Cited by Heinrich Schlier, kephalē, TDNT 3:673-682. 59. Wayne Grudem, Systematic Theology (Inter-Varsity Press/Zondervan, 1994, 200), pp. 494-497. 60. H. Wheeler Robinson, Corporate Personality in Ancient Israel (Philadelphia, 1935, 1964). 61. J.R. Porter, "The Legal Aspects of the Concept of 'Corporate Personality' in the Old Testament," Vetus Testamentum, 15 (3) 1965 , pp. 361-380. 62. Porter disputes Robinson's examples of corporate personality affecting legal matters, but acknowledges that corporate personality may well play a role in other arenas of social life (Ibid., pp. 379-80). Mark A. Seifrid ("In Christ," DPL, pp. 433-436) criticizes the concept as a "frequently used but ill-defined idea." A.J.M. Wedderburn ("Some Observations on Paul's Use of 'in Christ' and 'with Christ,'" Journal for the Study of the New Testament 8 (1985), pp. 83-97, especially footnote 30) prefers the terminology of "representative figures" to "corporate personality." J.W. Rogerson ("The Hebrew Conception of Corporate Personality: A Re-Examination," Journal of Theological Studies 21 (1970), pp. 1-16) concludes regarding Paul's concept of Adam and Christ in Romans 5, "Clearly, the idea of corporate responsibility is inappropriate here, and what is being asserted is that there is a psychical unity between Adam and the human race, and between Christ and the members of the Church." Rogerson concludes that the term "corporate personality" should be dropped from Old Testament studies, since it is based on discredited anthropological bases and is used ambiguously. 63. "Taken into account" (NIV), "reckoned" (NRSV), "imputed" (KJV, NASB) is the verb ellogeō, a commercial technical term, "to charge with a financial obligation, charge to the account of someone" (BDAG 319). Used here and in Philemon 18. 64. Leonhard Goppelt, tupos, TDNT 8:246-259. 65. St. Augustine, De nupt. et concup., II, xxvi, 43. 66. St�phane Harent, "Original Sin," The Catholic Encyclopedia, (New York: Robert Appleton Company, 1911), vol. 11, in loc. 67. Wayne Grudem, Systematic Theology (Zondervan, 1994, 2000), pp. 494-497. 68. Joachim Jeremias, "Adam," TDNT 1:141-143. See Philo, De Mundi Opificio. 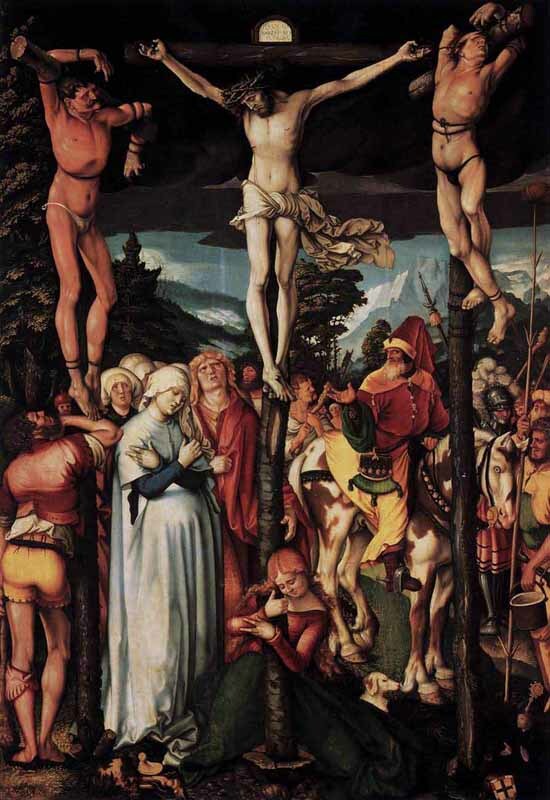 In the Apocrypha we read: "For the first Adam, burdened with an evil heart, transgressed and was overcome, as were also all who were descended from him" (2 Ezra 3:7, RSV; also 3:21; 7:48). 69. Epimenō, "stay, remain," here, "to continue in an activity or state, continue, persist (in), persevere" (BDAG 375-376, 2). 70. The word for "sin" used here is harmartia, the New Testament's most common term for sin, literally "missing the mark," "a departure from ... divine standards of uprightness." In some verses, it might be seen in almost personal terms, as "a destructive evil power" (BDAG 50-51). 71. Apothēnskō, "to cease to have vital functions, whether at an earthly or transcendent level, die" (BDAG 111). 72. Zaō, "to be alive physically, live." Here the word carries the idea, "to conduct oneself in a pattern of behavior, live" (BDAG 424-426, 3a). 73. En, BDAG 326-330, 4.c.